Paul has been battling rats in his backyard for years and after many attempts has found a working solution. The brown rat (Norway rat) and black rat (roof rat) have followed Europeans and their food supply to almost every place on earth, including, of course, California's Bay Area, where both kinds of rats are abundant. 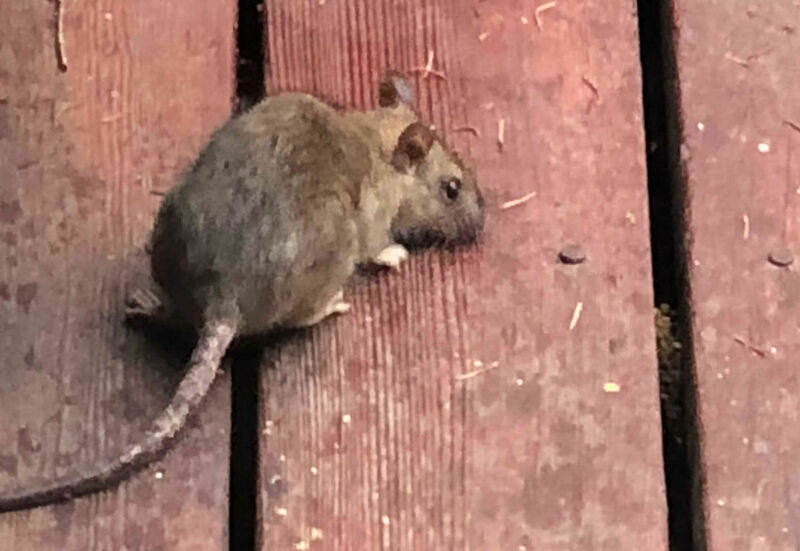 A rat on our Bay Area deck. Rats seek food, shelter, and water. Where these three things exist, you'll find rats. We live in San Mateo County in a canyon that has been invaded by ivy and blackberry tangles and generously planted with fruit and nut trees, providing shelter and food for rats. Kill all your indoor rats with the Rat Zapper, which humanely executes them and allows you to easily dispose of their carcasses. Remove, clean up, or lock up outdoor rat food sources such as barbecues or dog food. Seal off any entrances that allow rats to get into your house to look for food. But give up on the idea that your suburban outdoors can be rat-free. Expect to see rats outside once in a while. Let predators do their part to limit the rat population. To kill rats, we have tried poison, traps, and a “Rat Zapper,” a battery-operated device that electrocutes rats. All have their advantages and disadvantages. which we discuss below. We are most impressed with the Rat Zapper. Rats brought green poison bait pellets and dog food to this nest next to our barbecue. Note Norway rat turds. Advantages: Rat poison will definitely kill rats. Until recently, in California, you could buy rat poison in large green pellets made by D-con and others. We tried it. Rats found the pellets very appetizing; they hauled them to their nests. As they ate the rat poison, it killed them slowly, from internal bleeding. 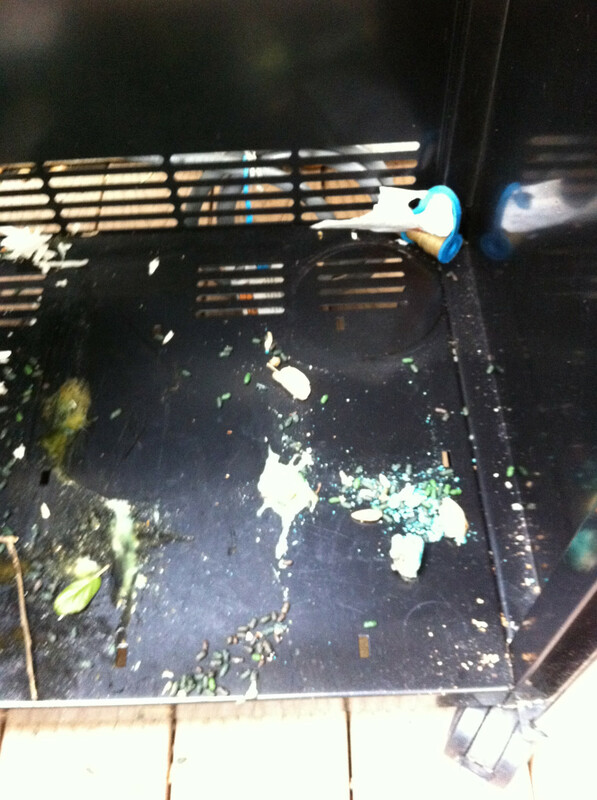 We could tell that they were eating the poison because the poop the rats left behind turned from hard pieces to a runny green liquid. If poison is used indoors, the poisoned rats may die indoors and have to be extracted from small spaces before they cause an odor. The pellets are poisonous to humans and pets, and the contaminated green poop had to be cleaned up carefully. It turns out the main issue with these green pellets is their danger to wildlife and pets. Since most rat poisons are slow-acting and long-lasting (see an explanation of this at the end of this article), poisoned rats dead or alive are also poisonous, and if sick or weak can be eaten by cats, dogs and wildlife—bobcats, lions, coyotes, hawks— who can in turn be poisoned. The EPA banned slow-acting anticoagulants packaged for household use, like these green pellets, in 2015. These and similar chemicals are still being used by professionals, though, and they are still a danger to wildlife. Furthermore poisons can't totally get rid of outdoor rats. Even though the county maintains rat poison dispensers in our creek, we still see rats on the deck now and then. I would not use rat poison now, partly because of the wildlife issues, and partly because the Rat Zapper is so effective at killing indoor rats. Rat traps work well, indoors and outdoors. Traditional rat traps, like in the video, are spring-loaded, with a trigger you attach bait to. I baited one of these with peanut butter and set it under the kitchen sink. In the middle of the night I heard a loud “slap," and knew I had caught a rat. In the morning, I went to the rat trap to see blood all over the inside of our kitchen cabinet, and in the corner, a large mutilated rat. I had to scoop the rat out with a shovel and place it in a bucket. Rat traps usually kill rats. Rat traps don’t always kill. Rats can escape maimed from a rat trap and suffer. If you find the rat, then it's up to you to kill it with a shovel or by drowning. I purchased a pellet gun to shoot the injured rats instead of doing it by hand. Rat traps may cause a distressing mess. A dying rat may drag the trap around, leaving a trail of blood and guts to be cleaned up. My brother introduced me to the Rat Zapper. You put some bait in the reusable trap, and when the rat walks into the trap, electricity—8000 volts—from the batteries electrocutes the rat in a few seconds. Then, all you do is dump the rat out of the trap into the garbage. My father-in-law had a rat problem: rats were getting into his hot tub, and making a new nest in the cabinet of his barbecue every few days. I sent him a Rat Zapper as a gift and he reports that he killed over 50 rats with it. Presumably he replaced the batteries several times, because four AA batteries are only supposed to be good for about 20 kills. Biconet, which sells the Rat Zapper and other integrated pest management tools, argues that a zapper it is safer to use around children and pets than poison or traps, because its entrance is designed to admit nothing bigger than a rat. If a dog or child does put a paw or finger inside, the electric shock should trigger a reflex causing the child or dog to pull away from the trap. I think the Rat Zapper is the way to go. Kills rats instantly—doesn't leave them wounded. Dead rats are easy to find and dispose of. Uses a lot of batteries. Not designed for outdoor use (though it can be used outdoors covered with a plastic bag or tarp to keep moisture from shorting it out). That the Rat Zapper is designed for indoor use doesn't matter much, because it's more important (and more realistic) to get rid of indoor rats than outdoor ones, as we explain below. People on the internet mention other rat control ideas, but few say they work well. Glue traps catch rats, but don't kill them: that dirty job is left to you. 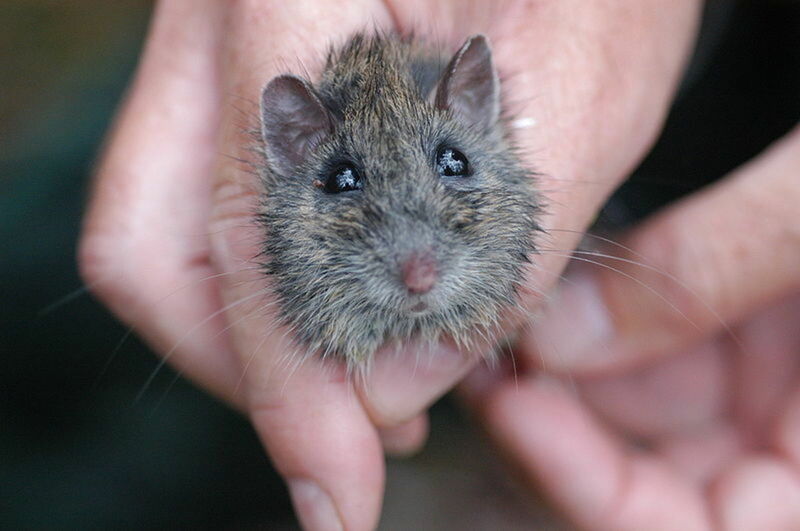 PETA and Friends of the Earth say glue traps are cruel and catch non-target creatures. Rat repellents like peppermint oil, ultrasonic devices, and night lights don't seem to be reliable. 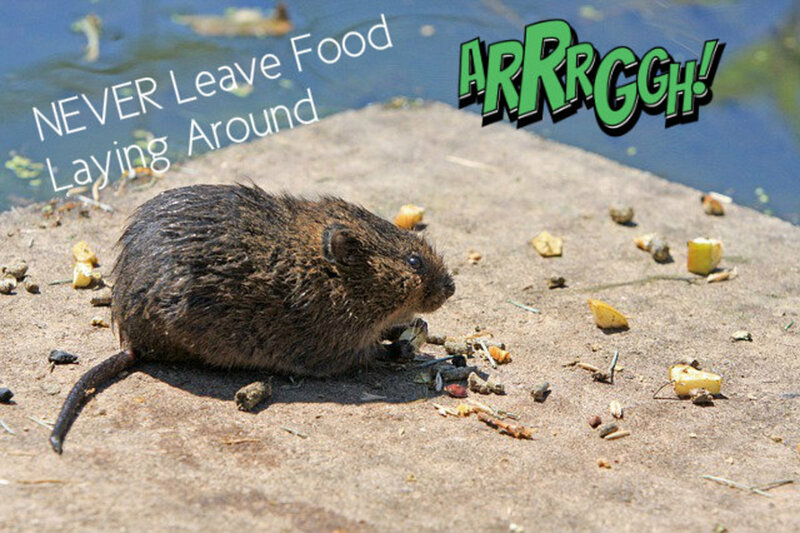 Rats may avoid these nuisances for a while, but when they decide they aren't dangerous, they will go back to looking for food like they usually do. Humane traps (live traps) have mixed results. The rats may figure out how to dodge them, and you have to figure out what to do with the live rat you catch. Cats will hunt rats, but some cats won't tangle with large Norway rats, for their own safety no doubt. Dogs have been bred for hundreds of years to help humans deal with rats. They catch the rats, bite them, and then shake them until they're dead. It's pretty gruesome to watch, but I could see hiring dogs to kill rats if I had a huge rat problem. First, understand these two species that go to so much trouble to get hold of human and pet food. Norway Rats or Brown Rats tend to stay low, are good diggers and swimmers, and use basements and sewers to invade houses. They like meat and get into barbecues. Their turds are more rounded than roof-rat turds (see one of the pictures above). In the 19th century, stagers of rat-and-terrier fights used to keep the prettiest Norway rats ("fancy rats") and tame them, and they are the ancestors of today's pet rats and lab rats. 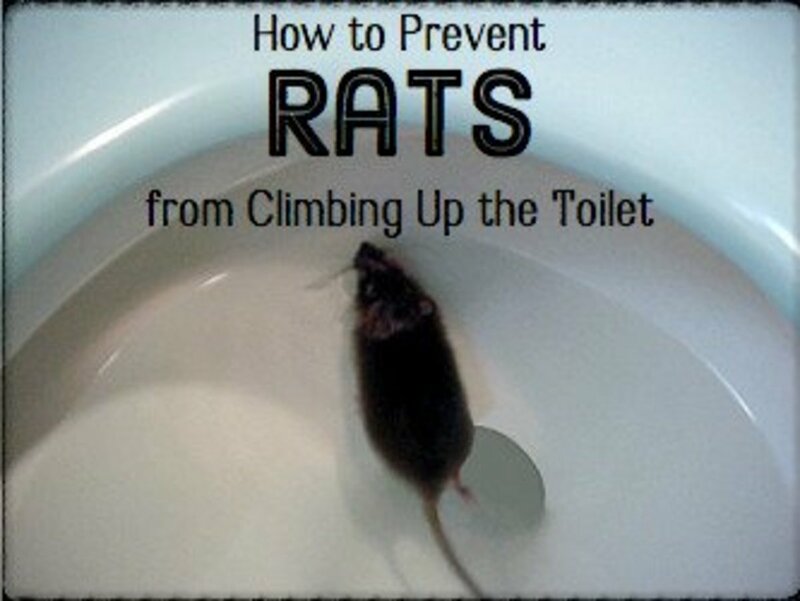 Roof Rats or Black Rats are smaller and better climbers. Roof rats tend to stay high, nesting in trees and woodpiles, and using tree limbs and powerlines for travel. They can range 300 feet or more from the nest, living in one backyard and feeding in another. They love backyard fruits and nuts. They may invade attics. Both kinds of rats are clever at staying out of sight, and at avoiding new things in the environment that might be traps or hazards. 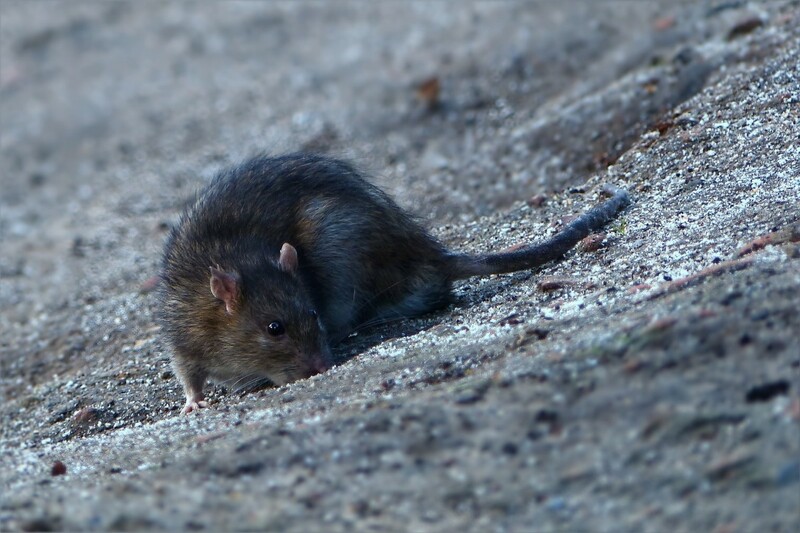 The University of California at Davis Integrated Pest Management Program, our San Mateo County pest control agency, and the Centers for Disease Control all have advice on how to close off openings that rats might use to enter a house. The idea is that you can't hope to eliminate rats in the great outdoors—humans have never been able to do that—but you can minimize some outdoor temptations like dog food and barbecue grease, and you can separate the human space indoors from the rat space outdoors. and remove tree limbs within three feet of the house so that roof rats can’t use them to leap onto your house. 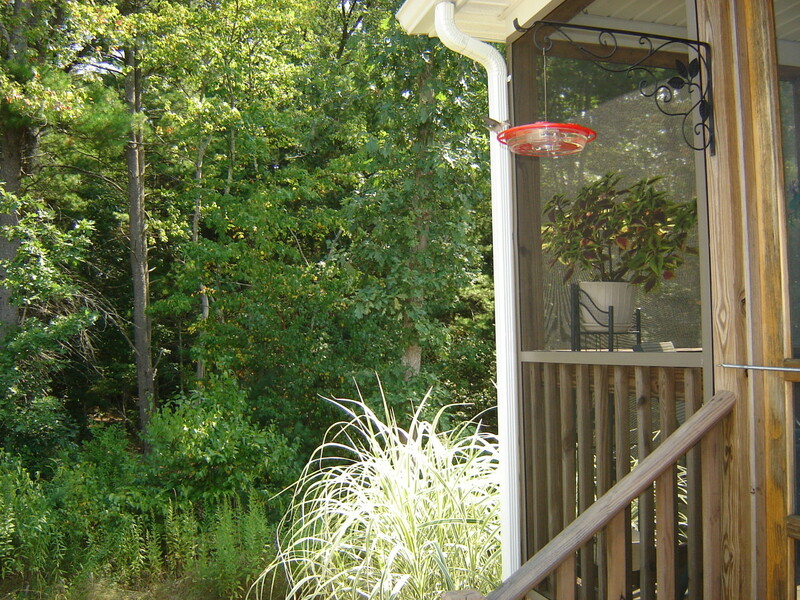 Problems arise when the boundaries between the inside and the outside of the house are kind of fuzzy. We humans find it convenient to go in and out of the house with our food and food for our pets. 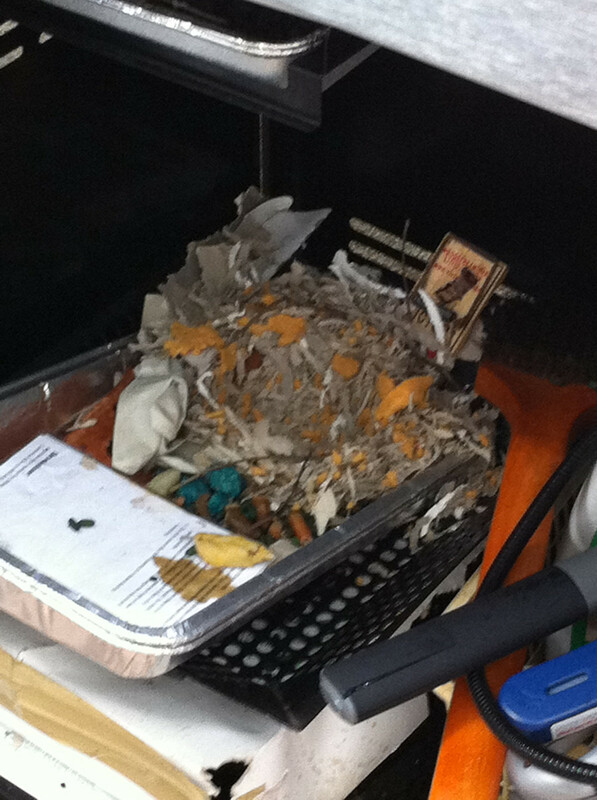 Rats will get what they can from our garbage cans, compost piles, barbecues, and bird feeders. The best long-term strategy is to minimize these outdoor sources of food, while sealing off your house so rats can't get to indoor food sources. Dry dog food must seem ideal to rats; portable, storable, full of protein. In fact, it makes a good bait for rat traps. If the dog food is outside, or where rats can reach it, they will get it, and stash it in their nests, including in parked cars. Access to a large supply of cat and dog food can create a horrific infestation, as in this veterinary hospital where rats were able to get into the building and eat the pet food. Keep your dog food locked up, not in dishes on the porch or an open garage. Closing all vents and stopping all holes with aluminum screening, aluminum duct tape, or steel wool (though one writer says a gas grill will melt steel wool). Covering it with a zippered cover. Killing rats with poison is a little more difficult than killing some other animals. Rats, like humans, are omnivores, and like humans experience the “Omnivore’s Dilemma” Michael Pollan describes: "What’s for dinner?" In other words, if anything might be good to eat, how do you know what is good to eat and what isn’t? One way rats find out what’s good to eat is that they avoid gorging themselves on a food or bait they aren’t familiar with, a behavior called “bait shyness.” They sample a new food or food-like substance and see if it makes them or other rats sick before they eat any large amount. Rats do this cautious nibbling not only because they are clever and conservative, but because they are physically unable to vomit. So poisons with a delayed effect are very effective on rats. The D-Con green bait pellets we used in the early 2010s were so effective for that reason: the poison, a second-generation anticoagulant rodenticide (SGAR), lasted a long time in their bodies, and only after a few days delay did it cause bleeding massive enough to kill them. But since 2011 there has been ample evidence that this delayed effect of a buildup of poison in the rat's body, such as from second-generation anticoagulants, causes rats to poison other animals who eat them. 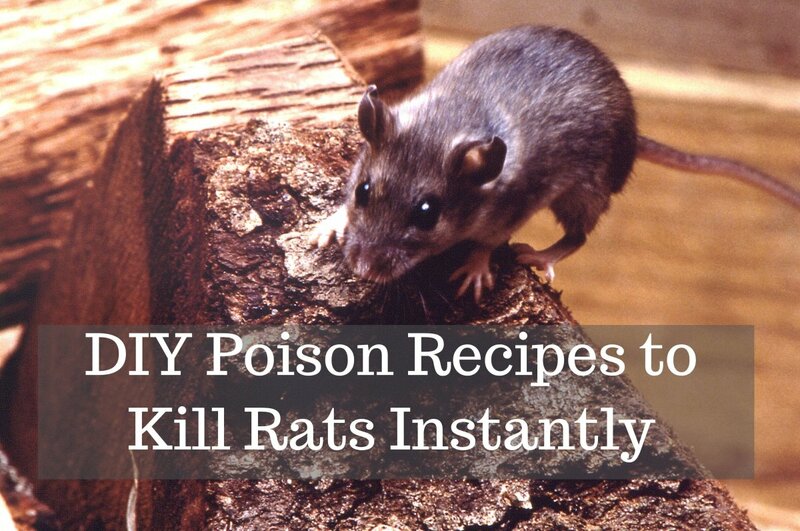 The rats may not die for days after they start eating the poison. In the meantime, any cat or dog who eats the poisoned rat will be poisoned themselves, as will any bobcat, lion, fox, coyote, hawk, owl, or eagle. The California Department of Fish and Wildlife, explaining this problem in detail, confirmed 400 deaths in these wildlife species and many others from SGAR rat poisons between 1994 and 2014 and they say the effects are likely much more widespread since poisoned wildlife may hide and die out of sight. CDFW even found “tertiary” poisonings, two mountain lions who died from eating coyotes who had eaten poisoned rats. The State of California banned four SGARs for household use in 2014, and EPA prohibited their marketing to households in 2015. EPA also prohibited the marketing of pellet-sized baits for home use (because the pellets might be eaten by children and pets). Lisa Owens Vianni of Friends of the Earth notes, however, that the 2014-2015 bans did not go nearly far enough to protect wildlife from anticoagulant baits. The four banned pesticides are still available for commercial or professional use—for example, in those bait stations you see in parking lots and malls and private property—and can still be bought online in quantity. Other long-lived anticoagulants like diphacinone ("Tomcat Liquid Concentrate") are still available for home use, and are toxic to wildlife. Anticoagulant rat poisons have been found in the carcasses of fishers (rare forest carnivores), spotted owls, and barred owls, and blamed for the deaths of suburban bobcats and mountain lions, even after the 2014-2015 law. The National Park Service trapped this mountain lion, P-22 or "the Hollywood Lion," and treated him for mange (skin parasites) and anticoagulant poisoning. Two non-banned anticoagulants (diphacinone and chlorophacinone) were found in his blood samples. Anticoagulants seem to cause mange in bobcats, because the anticoagulants affect the immune system. 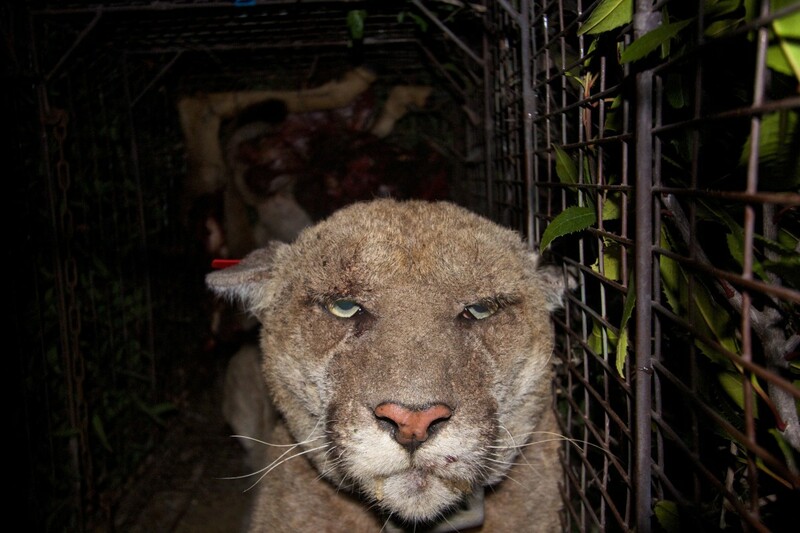 P-22 has recovered from his mange, at least partly, but another Los Angeles lion, P-34, died of rat poison, and another, P-41 was found dead with residues of both banned and non-banned anticoagulants. In 2018, a mountain lion was trapped just five miles from our house in San Mateo County. We don't know if this lion eats rats near bait stations in our neighborhood creek or elsewhere, but mountain lions do have large territories (100 miles on the average, according to mountainlion.org) and this lion was reported to have mange—a possible sign of anticoagulant poisoning. So, it seems like the wrong approach, from a big-picture point of view, to regard the outdoors as an infinite source of rats who need to be poisoned if they come near people. Rats with abundant food and no predators will breed rapidly, but in nature they have predators who keep their population within bounds most of the time. If predators were encouraged, they could limit outdoor rat populations in the suburbs. But poisoning outdoor rats with anticoagulants kills the predators along with the rats, due to the long life and slow-acting nature of these poisons. The only rat poison that has been found completely safe for consumption by humans, pets, and wildlife is RatX, a mixture of corn gluten and starch-like substances that absorb water in the rat's digestive tract. RatX kills rats from dehydration because rats, unlike other animals, are unable to vomit. Try this environmentally friendly rodent killing method. I tried and it works!, killing all rodents in my backyard that have overgrown and created havoc. - 1 Metal pot/pan enough to contain the above 2 kg powder. 1) Pour Flour into Pot/Pan and stir-fry until flour turn slightly brown and fragrance, then left to cool. 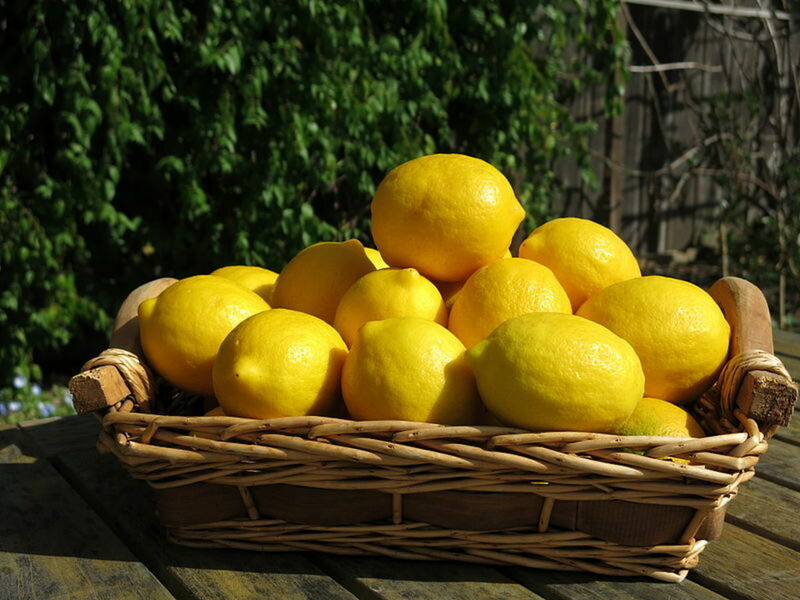 2) Once cool to room temperature, pour Lime powder into pot and mix thoroughly. 3) Use tissue paper and pack the mixed powder into small sacket. 4) Look for the rodent/rat hole and throw these sackets into the hole. The rodent will bite thru the sacket and eat the fragrance flour/lime mixture. Once inside their body, the thirty rodent drinks water and mixture harden. The rodent either died inside the hole or at drainage when they come out to drink water(easy to pick & disposed of). Results in a week ! This isn't fun, but I've seen a rat caught in a trap dropped into a pail of water and pinned down with a shovel to drown in. I've also seen a pellet gun used to shoot a rat in a trap. Another gruesome option is to use a spaid shovel and chop it's head off on the grass. Either way, you need to do something if it's alive and caught in a trap. Traps aren't great, that's why I prefer the rat zapper. It kills them pretty cleanly. I have an immediate problem. I have a rat trapped in a rat trap - Trapper T-Rex (black plastic snap kind). But it only caught its leg and the rat is alive and jumping around. It is in an outside cupboard. What do I do now???? How can I even get the rat out of the cupboard to kill it in another way? It's hard to know without seeing how you're doing it. Just be careful to keep the poison out of reach from other animals and kids. There is always the option of calling the exterminator. I keep putting poison down and the whole tray keeps going I will not return to my house as im terrified. Have you ever seen a pack of rats kill a cat? That seems wild to me. Could I add a word of caution about using cats to control rats inside? A cat that is confined to a closed space with even one rat, much less a pack of rats, is in danger of serious injury or death. A cat may be able to claw and kill a single rat, but it may die in a coordinated attack. And I'm not too keen on using cats anywhere there are snap traps or poisons. A rat got its leg caught in my snap trap and I stomped and stood on it trying to suffocate it. Until the rat quit squeaking only then I let my foot go off of it and the rat was still able to escape. I thought my 130 pounds was enough to kill it after 2 mins. Or at least make unable to run. I should've waited longer. I didn't have anything within reach to smash it with unfortunately. Will it die later from internal bleeding? Will it come back in a few days? If anyone has an opinion I sure would like to read it. I had to revisit this hub since I saw a rat on my deck yesterday. It was out during the day, which has me a bit concerned. After removing yet another rat from a trap, I'm buying a zapper. Just broke my heart to see that the trap broke the rat's lower back. I certainly hope it went quickly. This rodent was my fourth trap. The rodents have cost me three service trips from the washing machine guy to repair chewed water hoses. The last guy sprayed WD40 on the hoses; something rats and mice don't like. Who knew?! I am glad to see this hub, thanks for more information. You shot a rat in your house with a bb gun? I think the rat zapper is a better way to go. I had one come from an open drain in my house. He crawled up the wrong tube. My black lab greeted him with a neck shake. Somehow it got away and holed itself up in a space under my sink. Ordered a bb gun online and put bbs in it, came home tonight and found it hiding in the cabinet under the sink. Sadly, I didn't pump it enough times to drop it on the spot. Now I am going to have to pull out my sink to get the dead body before they start to reek. Iknow it's dying because I heard it make noises and now they stopped. Moral of the story, if your going to do it yourself, do it in a way it dies in a easy to access spot. 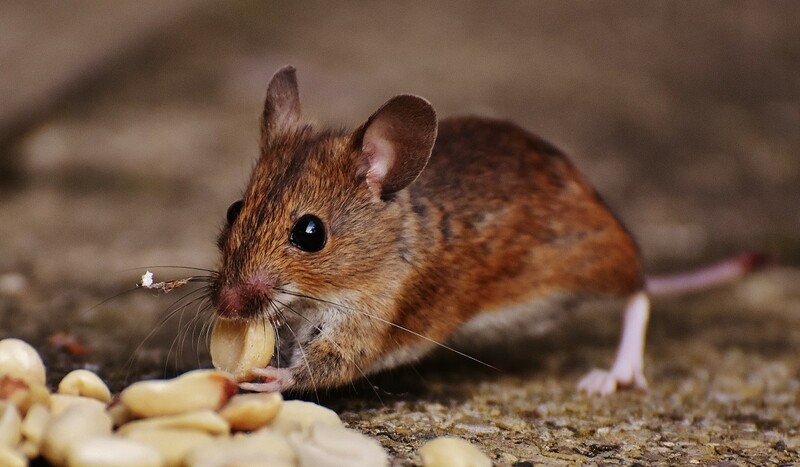 Mice, rats and other rodents are unwanted guests in many households. They will eat your food and chew holes in all kinds of items. They also carry several diseases that put you and your family's health in jeopardy. Rats are one of the most diseased rodents that will inhabit a house, and eliminating the problem needs to be done quickly. However, they are also very intelligent, and it doesn't take long for them to learn their surroundings.
. Live trap - A lot like the Ketch-All, a live trap is a lot smaller version of standard live cat and dog traps. A Fig Newton or peanut butter in the back behind the trigger plate does the trick every time. Electric Trap - This trap speaks for itself. 10 Homemade - This is for the guy who wants to make a better mouse / rat trap, or wants to try something different. The most common is the 5 gallon bucket and soda can with wire stretched across the top. Don't forget to place the board on the lip of the bucket (AKA plank), before you send the local mice and rat populations to their death. I have a rat zapper and I am so glad for it. Very good tips and I also like the zapper. It is horrible to get rid of them. Rodents are the bain of my existence! They scare me, and I scare them I am sure. Reducing the population in almost any way, shape, or form is just okay by me. I am not partial to the poisons however, they are just too inhumane for me. My fear with rat/mouse poison is that a rat that has eaten the stuff would be caught and consumed by a domestic animal (cat/dog) and cause the end of these fine creatures lives as well, and that is NOT a good thing. The Rat zapper you speak of, sounds perfect! Up and awesome Paul! Wow pretty gruesome stuff. But rats have to be dealt with.I like the sound of the zapper. Pretty humane way to go.Strangely, I have no fear of rats but I am really scared of mice. The weird thing is I even know the origin of my phobia. I wrote a non commercial hub about it.Voted up and useful. Three things about rat poison. (1) It used to be sold from feedstores as "Wafarin" and still may be as far as I know. It works because it makes the rat bleed to death internally. However, it's not lost on some old timers (like my husband) the irony of that -- because "coumadin" a blood thinner often prescribed for serious heart problems -- is the manufacturer name for generic "wafarain." At 68 he's convinced they are poisoning him. (2) When my daughter was a toddler, our apartment complex had a rat problem. They put the rat poison down and for whatever reason she ate it. Spent a terrified night in the hospital after having her stomach pumped and for that reason -- my advice is if you have small children or pets -- don't go the poison route. (3) Strange but true -- in the building my son, his wife, and two year old live in (in Hong Kong) rats are a huge problem. For about 4 months the building manager kept poisoning the rats on the common porches, everyone was upset because the dead rats decaying bodies had produced a horrible smell (or so they thought). Turned out the elderly lady above their apartment had expired and no one knew it as her corpse rotted for all those months. After the discovery, the manager posted a notice that no one is allowed to poison the rats and must only use traps -- to ensure that situation does not repeat itself. If I had not actually seen this work, I would not believe it. A plug-in-the-wall device that runs off rats and mice... even some bugs and ants... It does not bother/affect/effect small animals/pets... Ultrasonic rat/mouse repellents will help you get rid of rats in your home. These electronic rat repellers use ultrasonic sounds and other technologies that chase mice/rats out of your home and out of your walls. The sound and vibrations produced by the plug in rat repellents make living in your home and walls uncomfortable for the rats and chases them out.